The standard ice rink in North America measures 200 feet long by 85 feet wide. And every NHL game in North America is played on a standard-size rink, which means conditions in every building should be identical. Make that nearly identical. There are subtle differences in every building that most people never notice because the rinks are the same size. But players do notice that not every rink is the same despite being the standard 200-by-85. There are all sorts of things that change from venue to venue -- lighting patterns, the size of the boards, the style of the boards, the color of the seats, the color of the ceiling. After all, there is more to hockey than just skating, passing, checking and shooting. There are elements, and players have to know about elements. When Mike Liut was playing for the St. Louis Blues between 1979 and 1985 at the old St. Louis Arena, he noticed there was a totally different lighting system was installed in the building, which set the old place apart from the other 20 NHL rinks of the time. The lighting forced Liut and other netminders to take a somewhat different approach when they played in St. Louis. "It wasn't difficult to play there, but St. Louis was a rink where most of the NHL pictures, which would show up in magazines, were taken in St. Louis because they had a strobe (lighting) system," Liut said. "The lighting was conducive to taking those type of pictures. The strobe would go off and at times you would notice it, but not that it would really bother you. 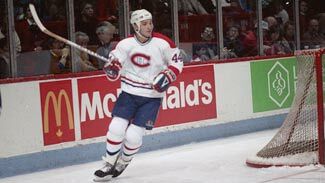 The young-at-heart Canadiens were a precocious lot in 1985-86 and it paid off as Patrick Roy, Stephane Richer and Claude Lemieux helped win a Cup. Mom, Dad: Guess who invited me to dinner? "It was just brighter (in the building), without a glare. It was different than Washington (where Liut played at the old Capital Center from 1989-92), that had the dark blue seats and the black roof; it was just a darker building." Liut played home games in two buildings that had quirks. It was too light in St. Louis and in Landover, Md., pucks, which are black, would come at him through a background of blue seats and a black roof. Neither place, however, compared to Calgary in terms of adjustments. "Actually for me, it was Calgary (the Saddledome) because to me there was a glare to it more than just bright. It was super bright. I liked the old one (Stampede Corral). The one with the high boards, it didn't impact me, but I liked watching the little guys climbing over them," he said with a laugh. "I was just never comfortable playing in Calgary, there was just something visually to me, I just saw it, it was very bright and there almost a glare. I was just never comfortable there." There is a lot more to goaltending than just stopping pucks. Goaltenders have to know buildings inside out. "(Goaltenders) come to understand that," Liut said. "A building that has a blue dasher versus a yellow dasher at the bottom (of the boards), that is a difference. You look at the old rinks, Toronto, Maple Leaf Gardens, the Boston Garden, Chicago Stadium, Buffalo, they were smaller rinks, there were quirks off the boards -- all affects playing goal." The small rinks are gone now, but those small rinks greatly affected play according to Tony McKegney, who spent the first four seasons of his NHL career (1978-83) in Buffalo playing at the Buffalo Memorial Auditorium, which featured an ice surface that measured 185 feet by 85 feet. Buffalo had a fast-skating team in those days and had a significant home-ice advantage that affected goaltenders like Liut. The Buffalo rink had a shorter surface between the blue lines, which changed the Sabres' strategy. "Yeah, actually we got used to the small rink and we used to really go after people," McKegney said. "We used to forecheck really well there, we got used to it. It was to our advantage to be at home. When we got to the big rink, we had a pretty good skating team, so for us it was actually going to a large ice surface like Montreal or Quebec or a lot of different rinks, it was easier for us to go into those rinks. It gave us more room, more freedom, you adjust to it. We had a good team, so we could play well anywhere." In Buffalo, the space between the blue lines caused the problem. "I liked the old one (Stampede Corral). The one with the high boards, it didn't impact me, but I liked watching the little guys climbing over them." "That was the shortest thing, that was the part that was the toughest to adjust to, between those two lines," McKegney said. Liut and McKegney played in an era where there were different rules that applied to the two-line pass. McKegney does think about the current rule change and what the game might have been like with the present two-line pass rule in place when he played in Buffalo with forwards like Gilbert Perrault, Rick Martin, Rene Robert and Danny Gare. "I think in the smaller rink, it would have been an advantage," McKegney said. "It would be a little bit more advantageous to do it there versus a larger surface. But we seemed to manage to score goals, which in retrospect when you think of then versus now, where they don't score as much, it is kind of weird to think they could be doing." The old St. Louis Arena, along with the old one in Buffalo, are long gone, as are the Cap Center and the Stampede Corral. Those buildings were filled with quirks. The St. Louis Arena was big enough to fit a 13-story building inside of it and had a roof that was designed to support a building so steel pillars wouldn't be needed in the stands, which was a common design when the arena opened in 1929. The building housed two NHL teams, the St. Louis Eagles from 1934-53 and the Blues, a team that started in 1967 and remained there until the building's closing in 1994. The Chicago Blackhawks also played "home" games in the building in the 1950s. "The St. Louis Arena was a great place to play," said Liut who also played in Hartford from 1984-90. "(Hartford) was a standard building that was also a comfortable building. It was steep for the fans. But it was good." Hockey is so much more than a game played on a 200-by-85 foot surface. There are so many small things that stand out, particularly if you are a goaltender. You better know seat colors, dasher-board colors and lighting, or you might let in a bad goal that can cost your team.